As more and more travelers are entering the market, the need for new resorts continues to soar, especially in Southeast Asia where so many of the new travelers are coming from. A trio of new resorts opened recently in Bali, Phuket and on the Fijian main island of Viti Levu. 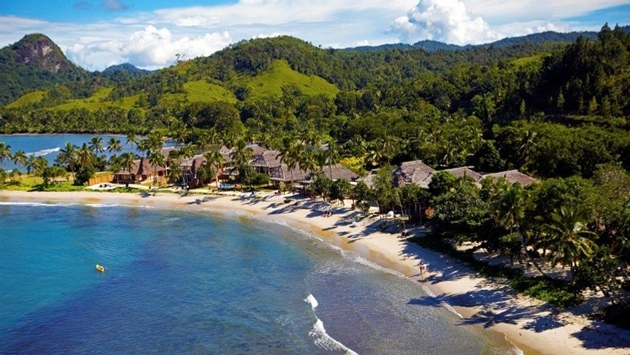 Fiji’s Pacific Harbour is beginning to attract a cluster of hotels, extending Viti Levu’s Coral Coast further east. The latest Pacific Harbour hotel is the $25 million Nanuku Resort & Spa which recently welcomed its first guests. Located a two hour drive from Nadi, Fiji’s international gateway, it’s the only all inclusive “all-villa” boutique resort located on the main island of Viti Levu. The resort has its own airport as well as two miles of private beach. As an all-inclusive all-suite property, the Nanuku Resort & Spa Fiji requires a three-night minimum, priced from $2,268, for two people, double occupancy, based on space availability. By all-inclusive they mean three meals a day and non-motorized activities, including paddle boarding, kayaking, snorkeling. The resort also offers a cultural program which highlights a range of activities, including Fijian village visits, kava ceremonies, Lali drum at meal times, and torch lighting at sun down. The stay is inclusive of private car transfer to/from the resort. Guests pay additional for spa treatments, game fishing and scuba diving. Located on 55 acres around the pristine Beqa Lagoon, the resort offers couples and families two-tiered choice of accommodations – the Vunikau Residence perched on a volcanic edge overlooking the lagoon, and Beachfront residences. The resort offers personal butlers, personal fitness trainers, private nannies and customized experiences. The resort’s suites and residences feature floor-to-ceiling windows and doors as well as spa baths, private yoga bures, plunge pools, media rooms, expansive desks, outdoor living rooms, private landscaped gardens, daybeds and spectacular ocean views. An opening special, the five-night Celebrate In Paradise, is available through March 3, 2015. The all-inclusive package is priced at $3,024 based on five nights minimum. 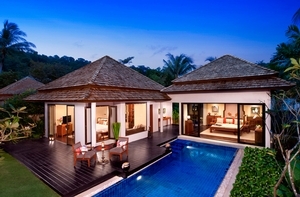 Anantara just opened its second property on the Thai resort island of Phuket. The Anantara Phuket Layan Resort & Spa is located on the northwest coast of Phuket on Layan Beach on the far end of Bang Tao Bay. Bang Tao Bay is on the quieter northern part of the island; about a half an hour drive from the more party-oriented southern part of the island. The resort is comprised of 77 suites and villas located on 400 meters of secluded beach, including a two-bedroom Family Pool Villa, a pair of two bedroom Pool Villas and a vast 485 square meter Anantara Pool Villa. The Anantara Pool Villa has direct beach access, a private pool and extensive outdoor areas of more than 200 square meters, accommodating up to six adults. Each of the 47 villas has a private pool and all villas come with a personal Villa Host available 24 hours a day. PHOTO: Anantara’s second Phuket resort is located in the more serene northwestern part of the island. The Anantara Phuket Layan features several restaurants including Sala Layan, an all-day dining restaurant; Deeplee, serving Thai cuisine; theInfinity Bar, for cocktails and Thai tapas; and the Breeze pool bar for cocktails, fresh juices and light poolside snacks. The ‘Dining by Design’ program features a menu by a personal chef, and served at a table for two in special locations, from an isolated enclave to a deck on a cliff edge – anywhere of the guests’ choosing. Spice Spoons, Anantara’s new cooking school concept includes visits to a local market to learn about and buy fresh ingredients to use in the resort’s open theatre kitchen. The resort also has a Children’s Club for younger guests of 12 and under, which offers daily complimentary supervised activities including full and half-day programs, as well as a Kids menu, cooking classes and a ‘Little People’s’ Spa menu. The new 306-room Swiss-Belresort Watu Jimbar, which opened in Sanur, one of Bali’s most exclusive areas, is one of 20 hotels that Swiss-Belhotel International plans to open this year. It’s Swiss-Belhotel’s first Swiss-Belresort branded property in Indonesia. The hotel is located in Sanur town about five minutes from the beach. The resort features what it calls “contemporary Balinese-styled rooms and suites” overlooking the lagoon pool or featuring a Jacuzzi or plunge pool. The main restaurant features a menu of international, Asian and Indonesian cuisine complimented by a lobby lounge and bar area offering snacks, cocktails and mocktails throughout the day.